Ask A Vet: Does My Horse Need Electrolytes? 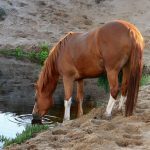 Most of us have heard the old adage “you can lead a horse to water, but you can’t make him drink.” If you have ever tried to get a colicky horse to drink water, taken your finicky horse to a new place, or worked your horse more than normal, you’ve probably experienced this adage firsthand. It can be very frustrating, as well as worrying, to stand at the water tank with him for what seems like an eternity, all while he acts utterly disinterested in the contents. The horses’ body is typically very efficient at signaling him when he should drink. The thirst response is thought be related to sodium concentrations in the body. 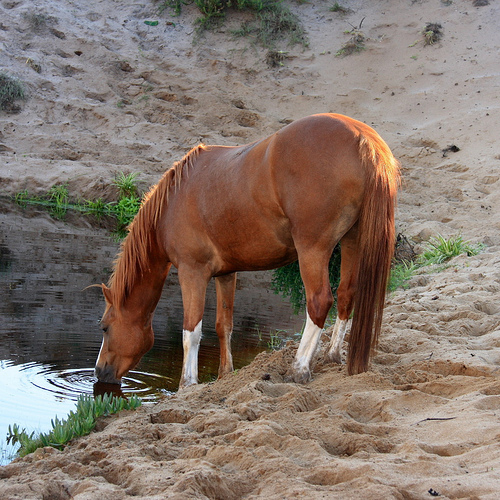 If your horse either doesn’t have enough water, or has “too much” sodium, it should encourage him to drink. It is this mechanism that electrolyte supplementation works on in the horse by adding sodium to the body, thus triggering the signal to drink. So when should you consider supplementing with electrolytes? Electrolytes can be very helpful in encouraging your horse to drink in poor weather conditions when they are prone to decreased water intake – such as cold weather – which in turn can make them prone to colic issues. Supplementation should also be considered whenever your horse experiences prolonged or repeated sweating day after day, as increases in workload that cause the horse to sweat more will lead to electrolyte and water loss. Horses can be supplemented on a daily basis with 1-2 ounces of salt. Alternatively, you can use a commercially prepared electrolyte mix, but make sure salt, not sugar, is the first ingredient listed. A key consideration when supplementing with electrolytes is that the horse must have free access to water. 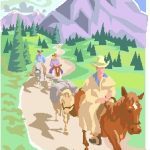 In cases such as trail riding and trailering, where the horse may have limited access to water, electrolyte supplementation could lead to bigger issues. In these cases of limited access, supplementation up to about 24 hours before the event may help prevent dehydration or colic issues by allowing horses time to “tank up” and maybe take on a little more water than normal. Supplementation should cease 24 hours before limited water access and continue during the time that their water access is limited, until free access to water will once again be available. Caution should be used any time a heavily worked horse is supplemented with electrolytes, as horses under extremely difficult or extended work can become dehydrated. If a dehydrated horse is given oral electrolytes, it could push more water out of the blood stream and into the gut, complicating the dehydration. Horses exercised in hot and humid weather are especially prone to the significant water and salt loss that can lead to dehydration. To evaluate the hydration of the horse, use a simple “pinch” test. Over the shoulder, pinch some skin: it should be elastic and quickly return to normal position. If it is slow to rebound, there may be some hydration issues, and electrolyte supplementation should be used cautiously at this time. If it appears that the horse is still drinking, then continue the regime as normal. If they have quit drinking then you may want to speak to your veterinarian before giving any more electrolytes. Finally, electrolyte administration should always be on the feed and not directly in the water. 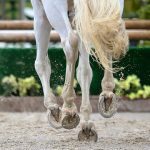 When administered on the feed, there are rarely palatability issues, but in the water, it could keep a horse from drinking and do the exact opposite of what you are trying to accomplish. If you do decide to supplement in water, be sure that their normal source of water doesn’t have electrolytes, therefore giving them two options to drink from. There are also commercial preparations in paste form available, which are certainly acceptable if label directions are followed. In the end, electrolyte supplementation is another type of preventative medicine, and with proper vaccination, deworming, and dental care, can keep our equine companions happy and healthy!